Walking is one of the easiest things one can do. We all do it every day. But, how does it feel when I say let’s walk 100 km in 48 hours!! “Are you kidding me?? ?” That’s exactly how I reacted when I came across the 100 km Trail walk challenge. It is indeed a crazy bet!! I have been into dancing and fitness for years. But, I never wanted to stop at just being fit. There has always been a kind of restlessness within me, an unreasonable desire to try out something new that I would remember for life and proudly tell my grandchildren about. That’s when I decided to push my limits and test my endurance and willpower, and there was ‘No way’ I could say a ‘No’ to this breath-taking Challenge-100km Trail Walk. I am not the only one doing this. There is a GOQii Army along with 1000s of people across India who are participating in this event, training for it day in and day out. Apart from training, there are 2 most crucial things that we need to pay special heed to. We need to keep our Glycogen stores ready. Glycogen is nothing but a storage form of Glucose (energy), which disintegrates to release glucose in the bloodstream when body demands energy. The only way to build up the glycogen stores is to Carbo-load our body 3 days prior to the event (exactly how the marathoners do). Many people consider it as a “golden opportunity”. That’s simply because we have all the liberty to relish the foods which are otherwise considered “fattening”.You might think I am joking, but we need this to blow up our glycogen reserves, which would ensure sustained energy supply during the event. It’s a complete carb-treat for 3 days! We need to have a mix of complex and simple carbs. We can enjoy Rice, Rotis, Potatoes, Sweet Potatoes, Fruits, Dry Fruits, Breakfast Cereals (Oats, Cornflakes, Wheatflakes, Muesli), whole wheat bread with Peanut Butter, Daliya (broken wheat), Idli, Dosas, Biscuits, Noodles, Whole Wheat Pasta, Spaghetti, Nachos, Tortillas. Go for tomato sauce in pasta/spaghetti/nachos instead of cheese sauce. Cheese stuff is too acidic which might just slow down our body. Acidic body equals to Less Oxygen to the cells. Thus, along with carb-loading, we also need to make sure we keep our body alkaline. Oxygen breeds in an alkaline medium, and our cells need maximum Oxygen during this period. Quick ways to ensure alkalinity- Grab a glass of lemon water twice a day or simply sprinkle lemon over your food before you eat or go for a bowl of sliced cucumber during lunch and dinner. Stay off Naans and Tandoori rotis. Most importantly, we need to stay miles away from the road-side food or unhygienic food as we don’t want to fall ill few days before the event or ever. 3 days prior, we need to double our water intake. If you drink 3 litres on a regular basis, you got to drink 6 litres now. This is just to make sure our body cells are well hydrated and well energized. Surprisingly, you don’t feel very much hungry during the walk as your primary focus is on walking and completing it. Now that doesn’t mean you should forget to eat. We need the sugar boost, we need the food! Carry dry munchies with you such as dry fruits, nuts, khakras, biscuits, cookies, rice puffs or wheat puffs, roasted chanas, peanuts, foxnuts (makhanas), soya nuts, energy bars, etc. and munch on them at regular intervals not only for energy but to prevent acidity and headache caused due to large meal gaps. When you halt for breakfast/lunch/dinner, make sure you aren’t loading your body with too much food. It might just make you sluggish and sleepy, making it difficult for you to get going again. Ensure that you effectively follow the ‘Portion Control’ mantra rather than going overboard with eating. Though we don’t feel the hunger, our thirst centre is very much active and we need to quench our thirst at regular intervals. It’s important that we don’t GULP down water but patiently SIP it. 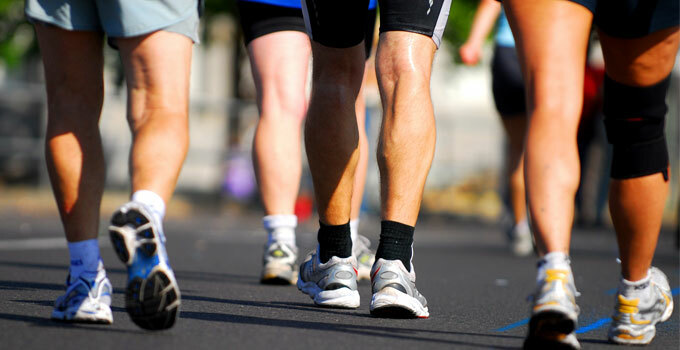 Apart from plain water, we also need electrolytes (Sodium-Potassium) to prevent cramps/spasms while walking. Carry a small 250 ml bottle filled with ORS (electoral/ glucon D/ enerzal/ lemon water with salt) and make sure it lasts for the 10 km distance, which means we need not even over consume the electrolytes. Remember, moderation is the key. Now this feels Wow!!! It’s time to celebrate! It’s time to rest and recover. Along with carbs, we now need adequate good quality proteins as well. Milkshakes or Fruit Smoothies, Paneer Roll or Paneer toast, Hummus with Pita bread, roasted Chicken or Chicken gravy with bread/rotis, Yogurt sprinkled with crushed nuts/chopped fruits/pumpkin seeds/sunflower seeds, Sprout Chaat with chopped veggies, Egg and Cheese toast, Grilled Fish with Boiled Potatoes and Salad, Bean rice (Rajma-Kidney Beans) with curd. These are a few ways of ensuring that your muscles are well treated with proteins for recuperation and that your body is fuelled with a good power supply (carbs). You can get your water intake back to normal, but make sure it doesn’t go below 3 litres. 12 glasses or 3 litres is what our body needs to stay hydrated even on a regular basis.